The Lamaze Flutterbug baby toy is packed with activity features including clanking rings, and soft teething textures. Stretch it out then watch it wiggle back into place! A quick-release clip makes it easy to attach to cot sides and on to pushchairs for 'on-the-go' play. Suitable for use from 0 Months. Exploring and experimenting from 6 to 24 months, moving and doing from 9 to 24 months. All Lamaze toys are designed to help baby explore and learn about their world. Lamaze follows key developmental stages for baby and works within baby's skill set from birth. A newborn baby cannot see very far at all but can hear very well so much of the Lamaze philosophy in the early months is around helping baby develop these senses. With Lamaze toys, babies will discover new skills no matter when the toy was originally bought. 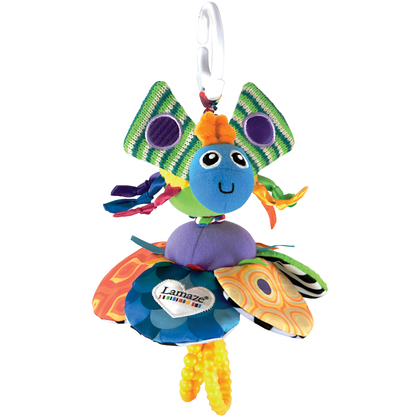 Lamaze provides babies with toys that will evolve as baby's senses evolve. So a toy bought when baby was very young will still be applicable to baby when they are slightly older. Babies will learn to play with Lamaze toys in a very different way now that they are mobile. Their motor skills will be developing at a great rate so babies should now be able to start playing the musical notes available in some of the Lamaze toys and will be able to better play with the stacking rings and shape sorters. So toys that you bought when baby was much younger because of their textures and contrasting patterns and colours will become more practical now.